Mind my words: soon ‘analysts’ will start writing that Selahattin Demirtas has chosen the violent approach to the Kurdish issue instead of following the ones who want peace. After all, he called for the people to make sure to protect themselves on the street, as the Suruç massacre has shown the citizens’ safety can not be placed in the hands of the state. Those who willingly or stupidly distort his words and his intentions, will for sure take this chance to bash the HDP. Just like the government’s media, which reported that Demirtas called for violence, although they know that the truth is far away from that. 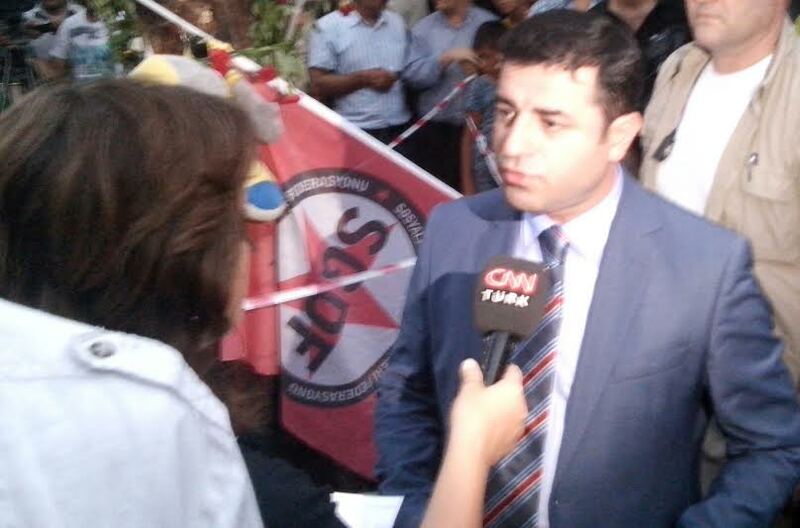 Selahattin Demirtas talks to CNN Türk, defending his call for people to protect themselves. Picture taken on Tuesday 21 July at the place of the Suruc massacre. You see, when it comes to the Kurdish issue in Turkey, there are analysts who seem to know their subject, but who don’t. Let me give you a guideline about how to judge columns and analysis about the Kurdish movement in Turkey, and whether you should take them seriously on this subject or not. 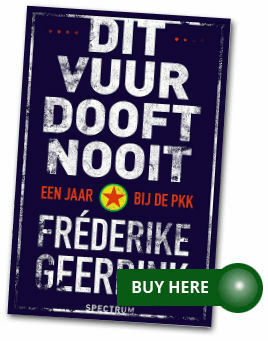 It’s easy: if they make it seem as if the Kurdish movement is deeply divided, they are writing crap, willingly or because they don’t know any better. I saw several exquisite examples recently. The first example is actually of nearly the whole Turkish press, which couldn’t hide its excitement over the ‘fact’ that Demirtas had said in an interview that he called on the PKK to disarm, but that of course the call was not his to make. Demirtas calls on PKK to disarm! Demirtas calls on PKK to disarm! See, they seemed to be saying, everybody in Turkey thinks it’s time for the PKK to disarm, especially now that the HDP has 80 MPs. Even Demirtas says so! Of course, that’s not what Demirtas said. He actually explained again, as he is apparently still not tired of doing, that just calling on the PKK to disarm is not realistic, that it is not the way to establish a lasting, sustainable peace. That peace comes via negotiations, and that for him to call on the PKK to lay down its arms would be lying to the public. And that the only one who can call on the PKK to disarm is Öcalan, and that he has his conditions, which are known to the government. Bringing real peace to this country, in other words, means first working on justice, on giving people their basic human rights. Part of this deal would be the release of Öcalan, because no imprisoned leader is in a position to call for the end of the resistance which he started – the PKKleadership in the mountains has made this very clear. Now some would claim this condition comes only from ‘the mountains’, and not from Öcalan, so that here another ‘rift’ in the Kurdish movement shows itself. But what would the same phonies say if Öcalan were to call for his own freedom? Your first guess is right: they would say Öcalan only cares about his own freedom. The HDP getting 80 MPs in the last elections seems to be a popular reason for thinking that the PKK now has to lay down its arms. After all, the Kurds now have a ‘legitimate’ representation in parliament. What does this mean, ‘legitimate’ representation? I know what they mean of course: they managed to pass the threshold. Does this mean that before they were not ‘legitimate’? That the ones who have been representing the Kurdish struggle for rights and freedom for decades in parliament were not ‘legitimate’ because they could not pass the morally illegitimate 10% threshold? The 80 MPs also seem to be a reason ‘experts’ think the HDP now has to choose. One even went as far as to present two choices, namely between teaming up with the PKK’s field leadership in Qandil, who warned that if Turkey starts an operation in Syria the PKK will wage a war against Turkey there, and staying in line with the view of Öcalan, who said ‘The nation state has decayed, we are now starting a struggle for democracy and freedom’? Apparently, getting 80 MPs is somehow seen as a big part of the solution of the Kurdish problem. The only thing it actually means is that more people in Turkey are, for whatever reason, drawn to the HDP’s message for fundamental change in this country, and that the party can step up its parliamentary work for peace. What it does not mean, is that the HDP has to choose. Even stronger: there is not even a choice to make. Of course, it is interesting to assess the power balances between the different actors in the Kurdish movement, like the Qandil leadership, Öcalan (let’s stop call him Imrali) and the HDP, but basically they are all of the same fundamental opinion: the only way much longed for peace can come to Turkey is via negotiations, to which the government has to commit itself again, after which a peace deal can be signed, after which the PKK will lay down its arms (or be transformed into a legal armed force of a Kurdistan region, like the peshmerga forces in Iraqi Kurdistan). That’s how peace processes go. Demirtas said it too in the interview: the government should accept the Kurdish movement’s conditions. When Öcalan says he thinks the concept of nation states is out of date and the Qandil leadership says they’ll react to a Turkish operation in Syria, in what way are these contradictions? They are two sides of the same coin. The Kurds in Syria are, after all, building a society based on an ideology that goes beyond the nation state, and how could they not defend themselves if Turkey puts that in danger? Maybe Öcalan would speak out on it just as fiercely as the leadership in Qandil – if he were a free man, but well, he is not, so we always have to keep his captivity in mind when assessing his comments, and, for that matter, the things he doesn’t say. There is no serious rift in the Kurdish movement. Any news journalist or columnist trying to make you think otherwise is a phony. Some of the writers of these news articles and columns may really think the way they write, others may know their subject much better than appears from their writings but decide to show otherwise because they have a hidden agenda. My advice to them: if you don’t know your subject, shut up about it, and if you do, show it. Then you would hit two birds with one stone: you’d show yourself as a sincere journalist or analyst, and you would actually make a contribution to peace in this country.